Whether you have kids, grandkids, or nieces and nephews, outdoor workouts are a great way to stay fit while also getting them involved and active. You’ll set a powerful example by having fun while taking care of your fitness and well-being. Choose 3 “Call-Out” exercises that will be called out when someone gets tagged. One person is it at a time. If you get tagged, shout one of the “Call Out” exercises. Everyone playing stops and does 10 reps of that exercise. The same “Call Out” exercise cannot be called out in succession. Once you finish your reps, you’re free to play again and if you got tagged, you’re it — so the faster you move through your call-out exercise, the sooner you can catch someone still wrapping up their reps. It’s a great way to really kick it into high gear! Choose 5-7 exercises or activities that seem to flow through the playground or jungle gym like an obstacle course. Youngest goes first. Time how long it takes them to complete the course and the designated reps at each station. After everyone goes through once and marks their completion time, see if you can beat your time for one to two more rounds. Offer incentive with a special prize for whoever beats their best time at the end. Choose 12 poses with fun names of animals, objects, and plants. Link 4 poses together into a mini-sequence. Make 3 mini-sequences using 4 poses for each. Repeat each mini-sequence 3 times through, focusing on deep rhythmic breathing. Finish in Corpse Pose or Easy Pose with hands at Heart Center. 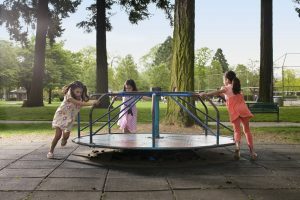 Even if you don’t have kids to romp around the park or swing with on the playground, you can still use these ideas to get creative on how to break out of your summer routine. Kids and adults alike love to game-ify everything — and it makes sense — games are fun! Might as well have fun while you’re staying fit!